My evening flight from Kathmandu to Delhi was canceled, so I had to take one five hours earlier. Although I wasn’t happy about the resulting extra layover time, flying earlier in the day meant that I had a glorious panorama of the Himalayas most of the way. Since Delhi is directly west of Kathmandu the 500-mile flight path was as if made to order for the view. The Himalayas are a feature of our world that call for silent awe, and need no supporting adjectives, such as “stunning” or “snow-covered.” They’re the antithesis of another, also beautiful, feature of our world, Cape Cod. Its glacial drift formations are a gentle lullaby to the Himalayan symphony. However, as we flew along the southern edge of the grand plateau, I took my eyes, or ears, away from that symphony from time to time because I couldn’t put down the book I was reading. In The Path: A One-Mile Walk through the Universe. In the book, Chet Raymo describes the path he took for 37 years from his house in North Easton, Massachusetts to the Stonehill College campus where he taught physics and astronomy. 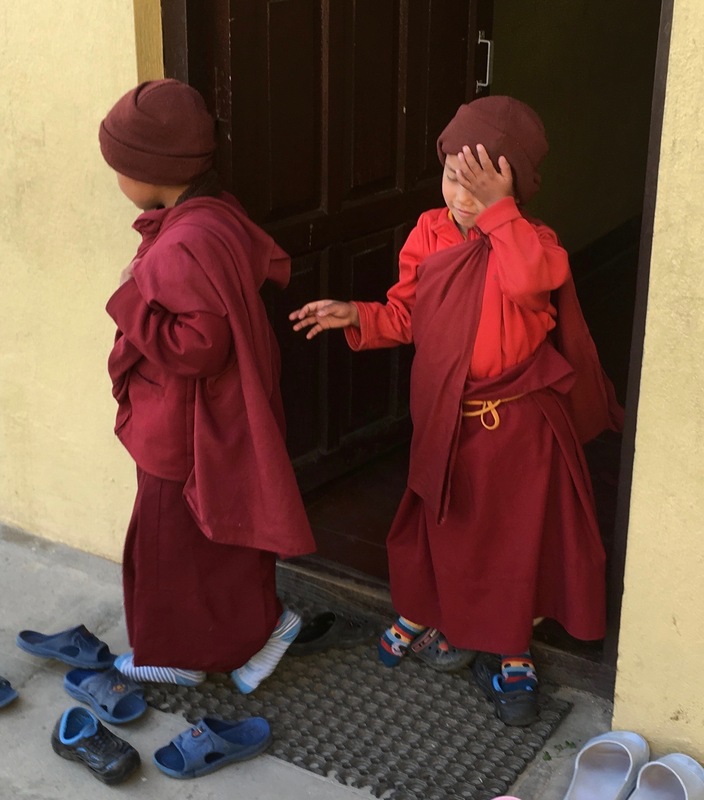 Millions of years ago India, drifting northward on the mobile surface of the earth, nudged into Asia and began pushing upward a double-thickness slab of the Earth’s crust known as the Tibetan plateau, the front range of which are the towering Himalayas. Raymo goes on to explain how sunlight beating down on the plateau produces warm air. As it rises, moist air from the Indian Ocean takes its place. This creates the Indian monsoon cycle. Heavy rainwater combines chemically with the Himalayan rock. The weathering takes carbon dioxide out of the air. As the mountains rose and eroded, the amount of carbon dioxide in the atmosphere decreased and Earth began to cool. On Northern continents ice sheets formed and moved across the land, grinding, abrading. Thus, mountains in Asia caused glaciers in New England and those in turn built the Cape Cod beaches where we swim every summer. The symphony is magnificent, but it needs the lullaby to follow. 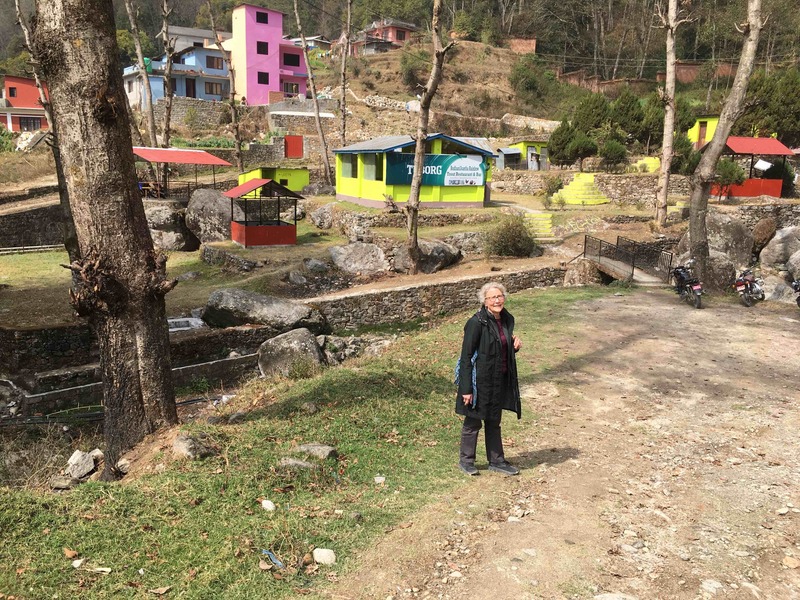 India continues its journey northward; the Himalayas continue to rise; the sun still beats down; the monsoons cycle onward, and the rains take carbon dioxide out of the air. But don’t look for the glaciers to return anytime soon to build up more places to plant your beach umbrella. Our technologies are now overwhelming these natural processes. Combustion of fossil fuels is adding far more greenhouse gases to the air, warming the world and covering up those glacial sands with rising sea water. I’ve just eaten for the second time at Raithaane in Saugal, Patan, and hope to do so again before long. The restaurant is a little hard to find at first. It’s about 300 meters east of Patan Durbar Square. The best route there is a walk through small alleyways. Raithaane serves tasty, inexpensive, local food from many regions of Nepal. It’s all fresh and organic. As our waiter explained they use tomatoes only where it’s appropriate to the particular dish, not tomato sauce on everything. A friend here in Nepal asked whether I had eaten. When I said “no,” she replied that there were still people in the café up on the 6th floor. I realized that I had been wondering whether there was still food. A person in Nepal might wonder that as well, but would think first about whether their friends would be there. Without friends it’s not lunch, even if there is food. 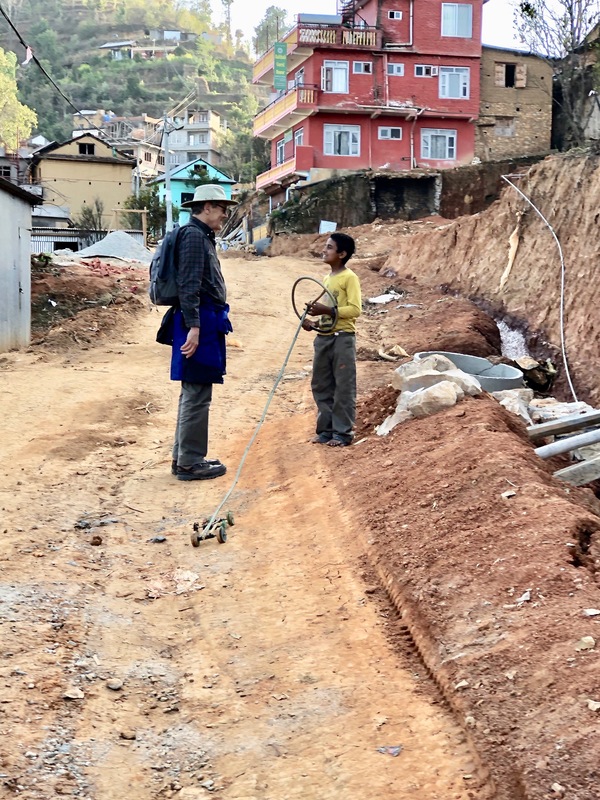 Shortly after I arrived in Kathmandu, I developed a standard walk to work. It was relatively safe from traffic, utilizing UN Park and side streets. Making it more interesting were were two bridges, one over the Bagmati River and one over Dhoki Khola, a tributary. Along the way there were shops, hiti with stone water spouts, Buddhist stupas and prayer flags, Hindu mandirs with temple bells, free range cows, goats, and poultry, wild dogs, schools, parks, snooker halls, motorbike repair shops, restaurants, tailor shops, soldiers, joggers, yoga and meditation practitioners, vegetable stands, young cricket players, roasted peanuts, and people of all ages, occupations, dress, and personalities. During my walks, I came to know one family fairly well. We speak as I pass by in the morning and evening, but also when I go out for tea or a neighborhood walk. Her English was limited (although far ahead of my Nepali). Maybe she meant “what is your name?” or “where are you from?” She might have been thinking “how tall are you?’ or “how old are you?” which are questions I frequently hear in schools. But her question as posed stuck with me. If I don’t self-identify with a proper noun, and I can’t answer with a number, what would I say? It’s remarkably easy to apply a label to another person–an “entertainer,” a “jerk,” a “scholar,” a “homemaker,” a “fun-lover,” “a ten year-old girl,” and so on. But doing the same to ourselves, leads to a protest. Yes, I am an “American.” Perhaps, that’s the type of answer my young friend expected. I have US citizenship and live permanently in the US. But that label alone is very incomplete. At the moment, I’m American, but working and residing in Nepal, a country for which I feel a great affection and even identification. I’ve also lived in other countries and have a generally internationalist perspective. Even with respect to the US, “American” captures only one aspect of who I am. I don’t want to be reduced to a single word. Why would I do that to another? So, I might grant myself the freedom to answer her question with several words. I recall giving her a facile answer at the time, a guess at what she must have meant. But if I really listen to what she said, and I have to answer in terms of what kind of person I am, or want to be, what would I say? A torrential rainstorm with angry winds woke us this morning. It appeared to be a day to hide under the covers. But the rain soon stopped and revealed a Kathmandu that is not always seen. 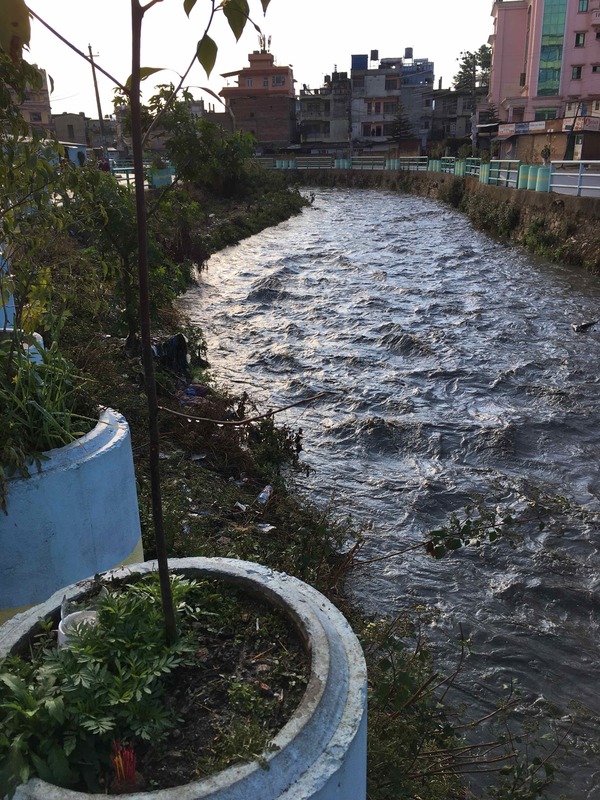 Both the Bagmati River and the smaller Dhoki Khola were full and rushing. I longed for a boat to launch into the waves. Arriving at King’s College, I joined others up to the roof to look at the surrounding snow-capped hills. A friend, Arjun, said that he had never in his life seen it so clear. Of course, the phone camera fails to show what it really looked like, but with a little imagination you can see the Chandragiri Hills to the southwest and the snow on top. 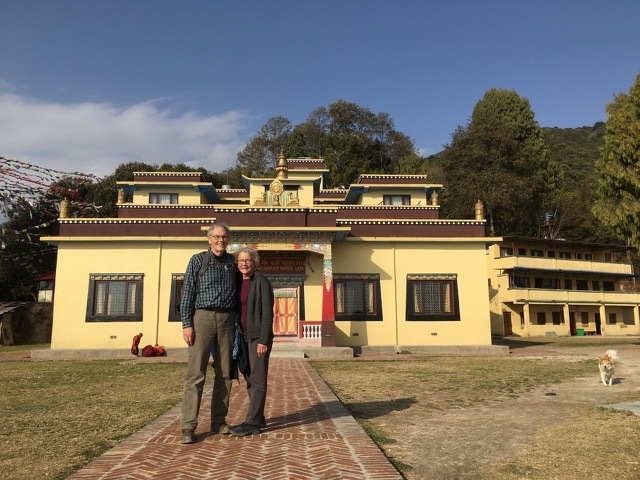 After a visit to the Jana Uddhar Secondary School, Susan and I decided to walk to nearby Nagi Gomba, a Buddhist monastery for nuns, with a residential primary school. 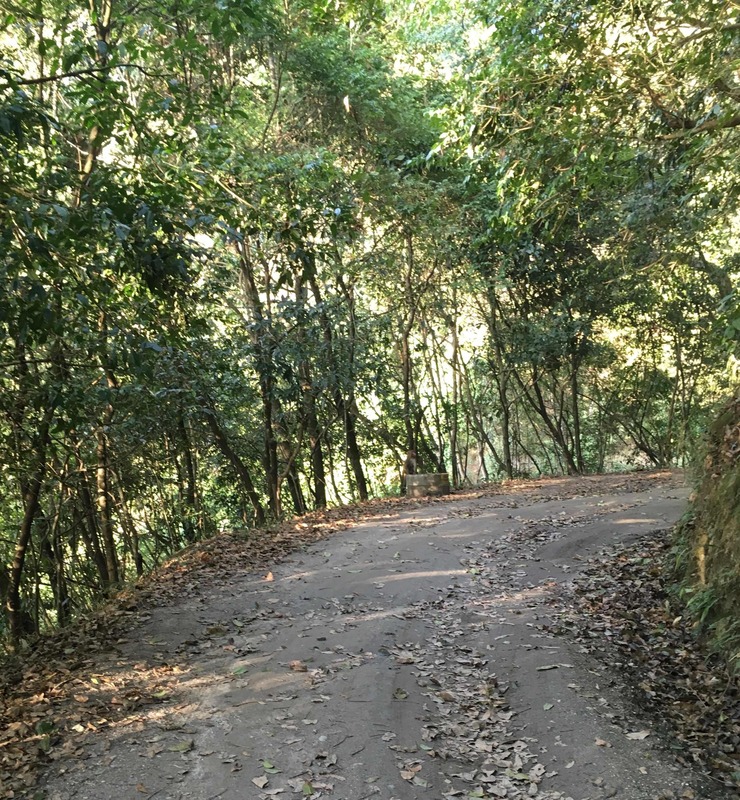 It’s located within Shivapuri Nagarjun National Park. Gaining access to the walking trail was more of an adventure than the walk itself. The road was rough, with occasional holes leading to underground piping. These were large enough to swallow any walker, a motorbike, or most of a taxi. 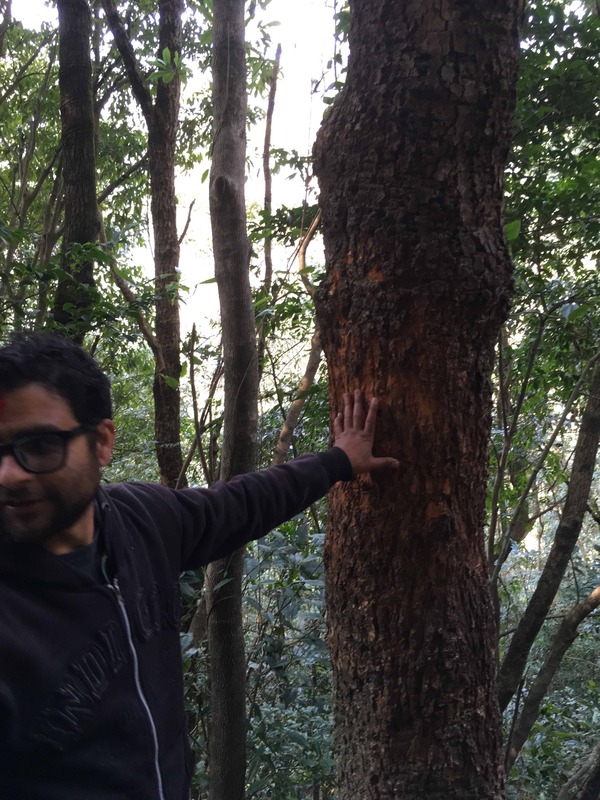 In the center of the first photo you may be able to see an Indian Crow. We decided to walk up the last mile or so, since that was faster than using a vehicle. 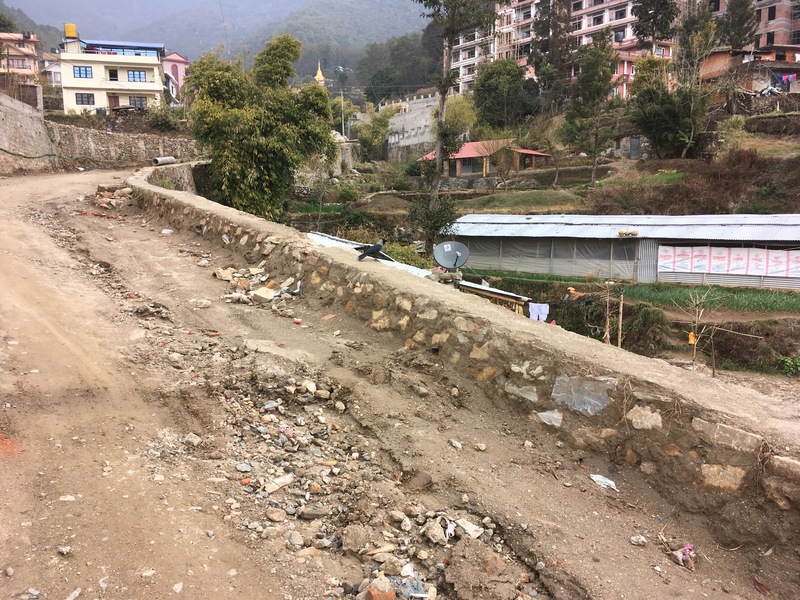 The road leads through the area north of Budhanilkantha, which is rapidly urbanizing. Farmers sell their land to developers who are building hotels, guest houses, and large private residences. 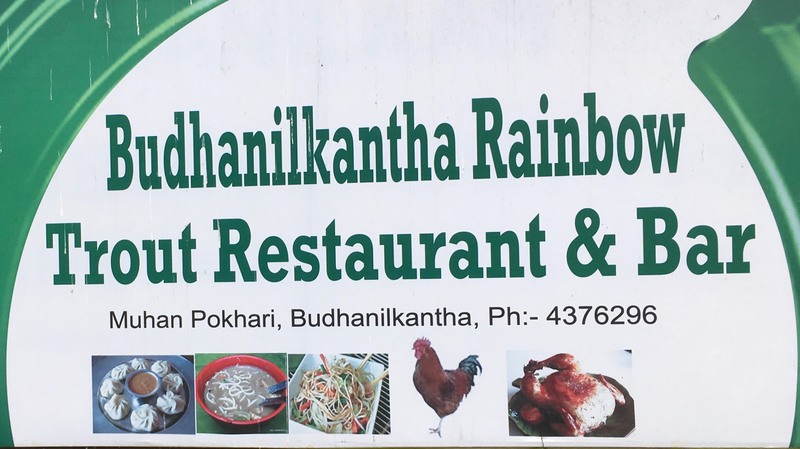 Before the walk itself, we stopped at the Budhanilkantha Trout Restaurant. They served absolutely fresh trout, netted as we watched from their tank. It was served either fried with very light batter, or cut up in “gravy,” a spicy, red sauce. The path to the monastery was easy, but on much rougher ground than the photo suggests. However, the main challenge for those of us who live on flat land at sea level is that we started at 5000 feet and needed to walk up to over 7000 feet. That’s higher, by way of comparison, than any mountain in the Eastern US. The vertical climb for our day was well over 200 flights of stairs. I must admit, however, that Nagi Gomba is considered just a start point for the climb to Shivapuri peak, and that peak is not even listed among real treks in Nepal. Along the way, we saw an asami monkey, a pheasant, and as you can barely make out in the photo, scratch marks from a spotted leopard, establishing his new territory. 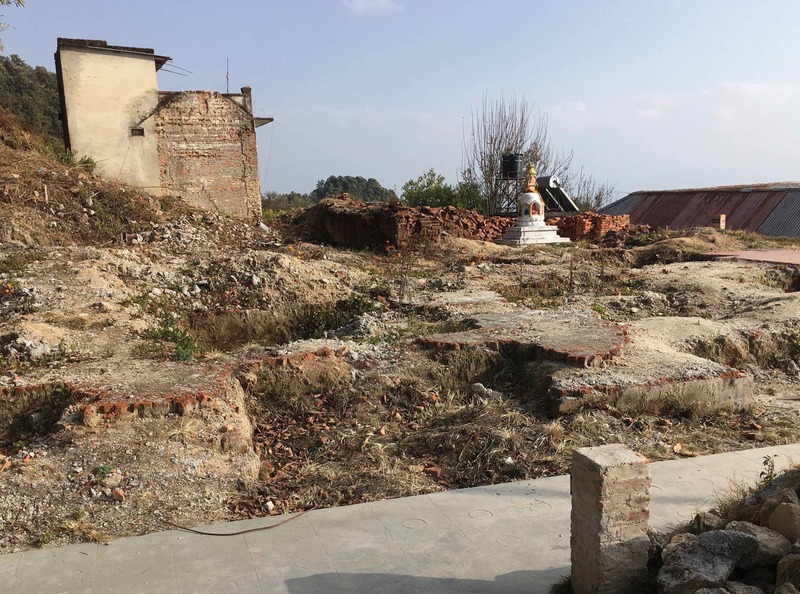 The first sign of the monastery, is a distressing one, the effect of the 2015 earthquake. So much was destroyed. But much has also been rebuilt. Nagi Gomba is now home to 150 nuns, including many girls in the primary school. 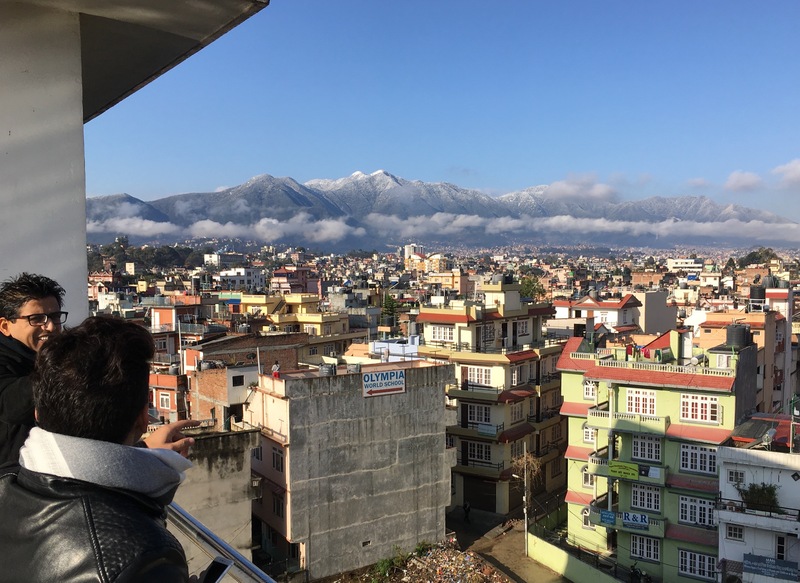 Maker spaces are a hot topic in Kathmandu. Karkhana is well known for its space, and for extending its activities from technology to science education. It has also supported maker space work in both private and government schools. 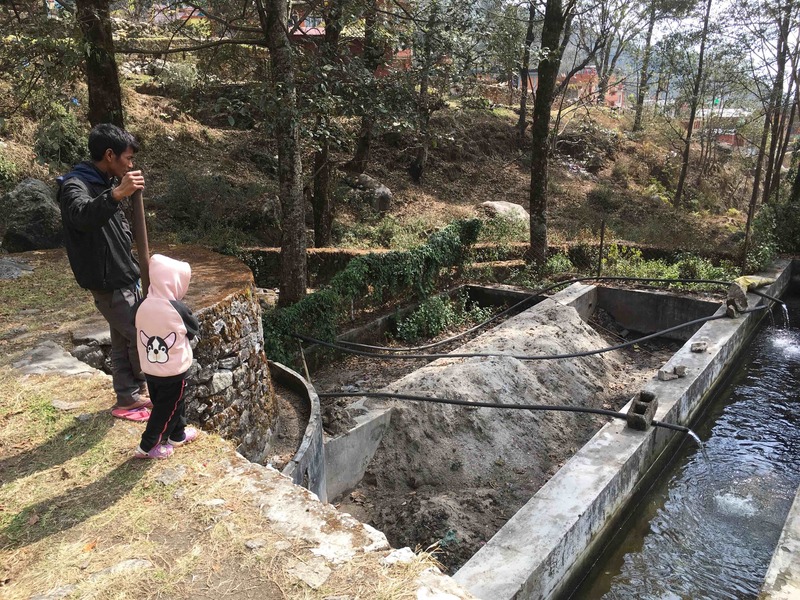 Nepal Communitere is a Nepali run non-profit founded after the 2015 earthquake, which provides a collaborative space for the community. It gives individuals and organizations the means to develop innovative solutions and become self-reliant. A key part of its work is maker spaces for clothing, ironwork, and other media. There are also Maker Faires, maker keti’s (especially supportive for girls and women), and many other examples. Yesterday I happened upon another, but this one, as far as I can tell, is an individual effort. Jenish showed me his car. It’s 16 inches long. There are wooden wheels, six of them, much like an extra-terrestrial rover might have. That’s useful for the rough street it has to navigate. Steering is controlled through a normal sized wheel. It’s made of a hose, bent into a circle and held by tape. The main structural elements are from bamboo, a widely available resource. The steering is just reliable enough not to be frustrating, and just unpredictable enough to be fun. View from our balcony this morning, showing part of Balthali, fog, and the LangTang Himalayas beyond.